PrintNode will work on both Mac and PC and the steps below are essentially the same other than the installation of the application. When receipt prints. This means every time you print a receipt from You'reOnTime the cash drawer will pop. This is the default setting for most printers and drawers. Only for cash sales. Only if a sale is a cash sale and you will be required to add cash to the till or give out change will the draw pop. For every sale. For every sale even if a receipt is not printed and it is not a cash sale the drawer will pop. The other option that might be useful is Print business copy of receipt . Some businesses like to keep a second copy of the receipt for every sale for their own records. If this is ticked a receipt will always print even if you are not printing a customer copy. 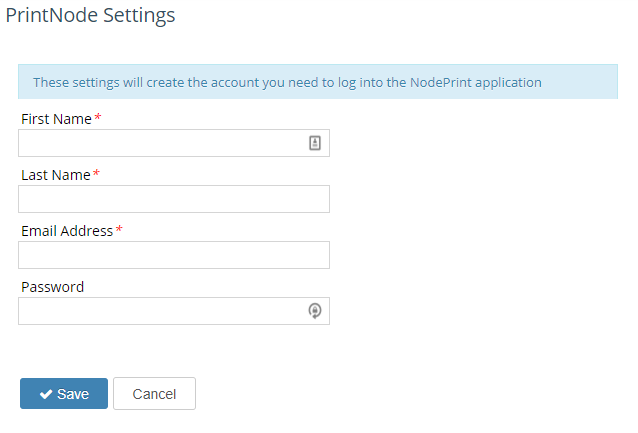 Once you have done this print node will be enabled but you will still need to create an account and install the application. Enter a Name, Email and Password for the account you creating in PrintNode. You will have to log into this account on each computer you wish to print receipts to, but once you have logged in on those computers it will remember and stay logged on. 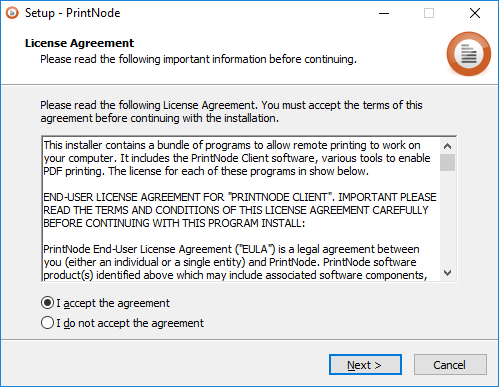 After creating the account you will need to install the PrintNode application. Once you have downloaded run the Setup application. When installing click Next through the setup wizard to use all the default values. After the installation is complete and you open it for the first time it will prompt for a username and password, this is the same username and password you created in the previous step, Creating a PrintNode account. Once installed the PrintNode will be loaded automatically every time you restart your computer. You should install PrintNode on all computers that are connected to a printer you wish to print to. 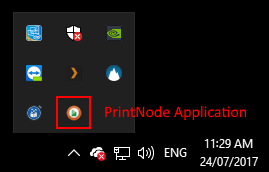 Now that PrintNode is running you should see a little icon in the tray (clock) of your computer like this one. Click on Manage Terminals under the Sales section. If you have already got a terminal configured you can click on it otherwise create a new one. In the terminal's screen, assuming you have created an account and logged into the application as per the previous sections, you will see all your printers listed. Select the printer you wish to print receipts to. 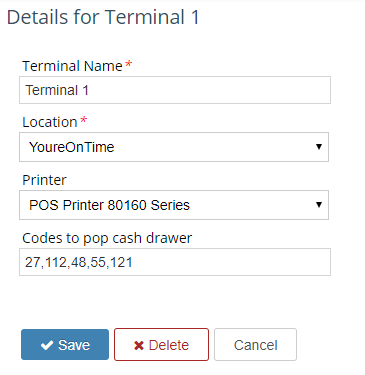 You will also need to setup some special codes in the PrintNode to control the popping of the cash drawer. The PrintNode is by default setup with the codes for the Epson TM-T88V printer, so if you have that model you don't need to do anything. Once you have done all of this it should be ready to go. Print a test receipt from the sales screen and make sure it comes out of the printer a few seconds later as expected. Important: As the PrintNode requires us to license the technology from a thirty-party company there is an additional $5 per month charge on your subscription if you sign up for a PrintNode account.